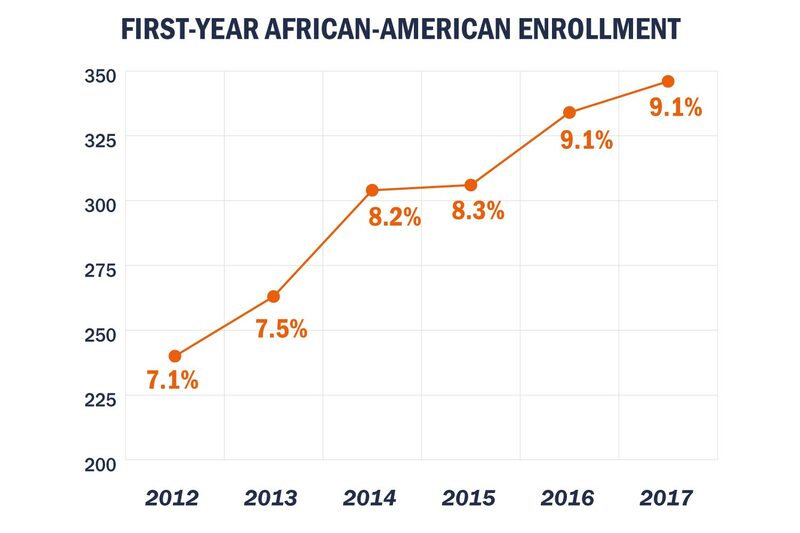 Over the past five years, UVA has made major progress in enrolling minority, first-generation and low-income students – the result of focused recruitment and retention efforts. 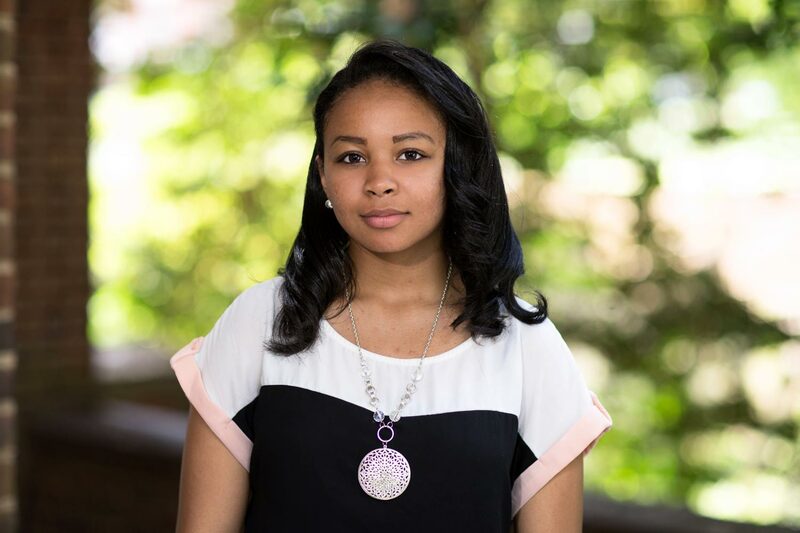 When Kiara Rogers first enrolled at the University of Virginia, she wasn’t quite sure where to turn for advice about life on Grounds. Then the Chesterfield County native got a letter from UVA’s Office of African-American Affairs, pairing her with a student mentor in its nationally recognized Peer Advisor Program. Now a third-year student in UVA’s Frank Batten School of Leadership and Public Policy and a peer adviser herself, Rogers enjoys offering similar guidance to new students. The Peer Advisor Program is one of many elements in a coordinated effort by the University to attract, enroll, retain and graduate talented students from diverse cultural and financial backgrounds. The effort is producing clear results. Steady improvement in these and other critically important metrics reflects expanded and sustained efforts to connect with and welcome potential students from underrepresented populations. The Office of Admission partners with the College Advising Corps in Virginia and community-based organizations nationwide like Posse, Mastery Charter School, the College Bound Initiative and YES Prep to extend UVA’s reach and strengthen the support network for first-generation and low-income families. The University’s fall recruitment programs to urban and rural areas of the country, undertaken jointly with with Harvard University, Princeton University, Yale University and Wellesley College, allow it to connect with high-achieving, low-income students and spread a message of access, affordability and inclusion. Additionally, the Office of Admission offers open houses specifically for Hispanic and African-American students. It also waives application fees and provides travel reimbursements to low-income students interested in applying to and visiting UVA. Between 2012 and 2017, the overall undergraduate population grew by 9.5 percent, while the number of undergraduates who identified as a minority grew by 22.4 percent. UVA this fall reported undergraduate enrollment of 16,034 students. 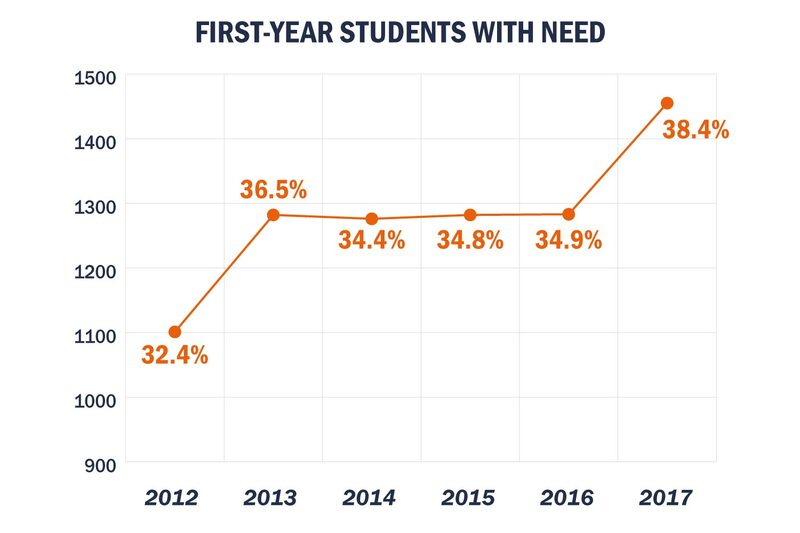 In that same five-year span, the number of first-years with demonstrated financial need grew by about 33 percent. Pell Grant recipients make up an estimated 13 percent of the new class. The University is committed to making a world-class education attainable for all students and pledges to meet 100 percent of every student’s demonstrated financial need. UVA’s Student Financial Services office, which administers the financial aid program, finds the unique combination of scholarships, grants and loans that fits each student’s needs and works to limit debt after graduation. UVA caps need-based loans to an average of $4,500 per year for in-state students and $7,000 per year for out-of-state students. The school further lowers traditional financial barriers for all talented low-income students by offering programs such as the Blue Ridge Scholarship, the University Achievement Award and the Questbridge Scholarship – all of which are designed to reduce the cost of attendance by increasing grant funding and reducing student loans. Beyond financial aid, UVA has a number of initiatives designed to help students from low-income or first-generation backgrounds thrive in their new environment on Grounds. The Rainey Academic Program, for example, identifies students who are first-generation or have high financial need and offers them the opportunity to take summer classes on Grounds and meet with faculty before their first semester starts. This helps them start building a social support system early and learn about aspects of college life that might be unfamiliar to them and their families. 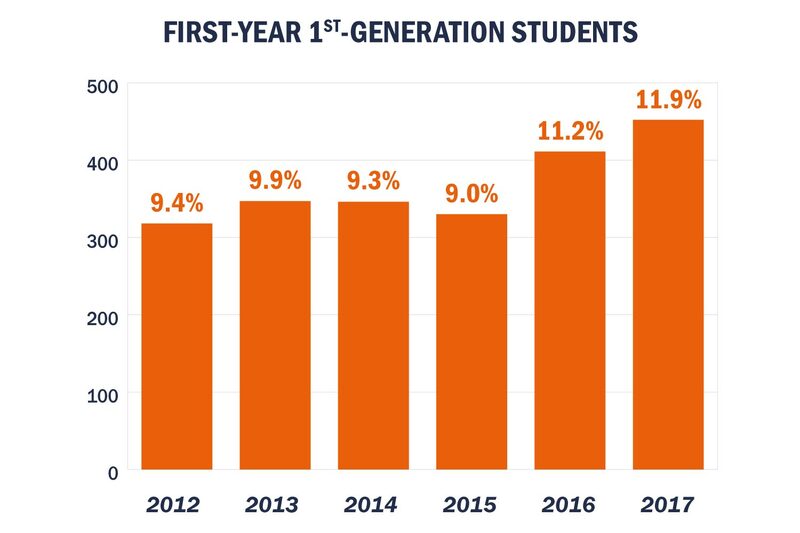 Nearly 12 percent of the current first-year class consists of first-generation college students. In addition to its Peer Advising Program, which facilitates entry and adjustment upon matriculation, the Office of African-American Affairs hosts the GradSTAR program, an overlapping initiative that specifically focuses on the cognitive skill sets needed to graduate into competitive professions or graduate school. The leadership programs of the Luther P. Jackson Black Cultural Center dovetail with GradSTAR and Peer Advising by furnishing and enhancing the leadership skills needed to succeed at UVA and upon graduation. “Equipped with nimble and multiple cognitive and non-cognitive skills, our students can be sure to be prepared for the near future,” according to Maurice Apprey, dean of African-American Affairs and professor of psychiatry. The University offers further support to minorities and students of all backgrounds with numerous peer-mentoring and advising programs across Grounds. Initiatives such as UVA’s Hispanic-Latinx Peer Mentoring Program and Peer Advising Family Network provide peer-to-peer mentoring opportunities to students who identify as Hispanic and Asian, respectively, and the UVA Student Council’s ULink allows all interested first-year students a chance to apply for an upperclass adviser. Creating peer-to-peer networks like those established through the Hispanic-Latinx Peer Mentoring Program and practicing early outreach to minority students have been important steps in enrolling and retaining new diverse talent at the University, but the school’s efforts do not stop there. UVA is always working through new avenues to ensure that its doors are open wide to students of all backgrounds, Roberts said. *In compliance with federal requirements that began in 2009, students may report race and ethnicity in more than one category. The rules require that schools report only one category of race or ethnicity per student to avoid duplication. This allowed students to be more detailed in their selections, but limited how individual diversity was reflected in official institutional totals. For example, under federal guidelines, any student who reports “Hispanic” as a racial category alongside other categories is reported as Hispanic. A student who lists multiple races that do not include Hispanic is listed as “multi-race.” This means a student who lists both Hispanic and African-American would be reported as Hispanic. The graph above includes students who listed themselves solely as African-American or as African-American and other races.